Truth or Consequences – What’s With That Crazy Name? Ralph Edwards’ popular game show, “Truth or Consequences,” opened every week with these words. The show aired on the radio from 1940-57, and on television beginning in 1950. Why? Because it seemed to embody the same philosophy as Ralph Edwards and his show – namely, “A real friendliness for people and a desire to help mankind.” The city had the means to carry out this creed due to numerous local resources: its healing hot springs, the Carrie Tingley Hospital for Crippled Children (now the New Mexico State Veterans Home), a pleasant climate, close proximity to Elephant Butte Lake, and the genuine western hospitality of the people. The show’s producer visited Hot Springs to work out the details with the mayor, the Chamber of Commerce, and other local big-wigs. A special election was held on March 31, 1950, and the name changed passed, 1294 to 295. 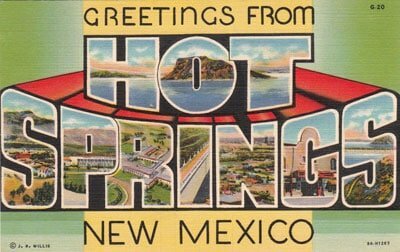 And that is how “Hot Springs New Mexico” became a town named after a game show! 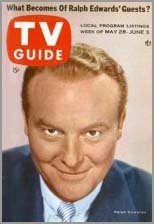 The very next day, on April 1, 1950, Ralph Edwards flew in with his wife Barbara, members of his staff, and press crews to conduct the 10 year anniversary broadcast of the game show “Truth or Consequences” from the City of Truth or Consequences. The event and the city received an avalance of nationwide publicity. Since the event occurred on April Fool’s Day, many assumed it was a practical joke! Much of the information above was borrowed from the T or C Fiesta website and the booklet “Fiesta Memories: Truth or Consequences New Mexico, 1950-1992, A Ride Through Our Past,” edited by Charlotte Bacon with caricatures by Patrick Trujillo.